New England Agility Team trial, Greenland, NH | Can I Bring the Dog? Saturday morning it was raining to beat the band, but the radar indicated that the worst of it would be through Greenland by 9 or 10 AM, so I put me, Chico, several pair of dry socks, extra rain gear, dog-towels aplenty, and a mug of tea in the car and headed out. By the time we arrived at 8 AM the rain had reduced to a mist. By our first run, it wasn’t raining. 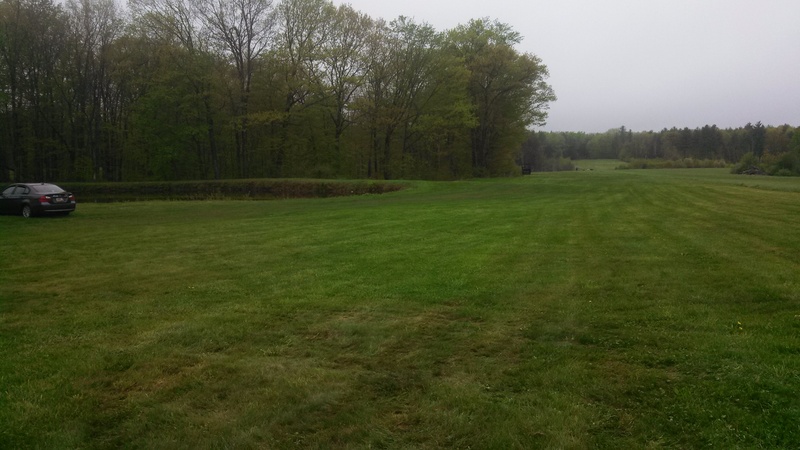 The venue Sanderson Field, is a well-maintained, grass landing strip with just tons of room for doggies to run and play when they are not competing. View from the back of the car, around 9:30 AM. The clouds parted, the sun came out, and by the time we left at 3:30 that afternoon, it was 79 and sunny. Warm enough for Chico to take several dips in that pond on the left of the image. And he wasn’t the only dog who enjoyed the pond and the fields. I asked a friend to record our Standard run. It’s absolutely awesome except the weave poles, where, I realize I was terrible to my partner. I drilled him, I grilled him, I darned near worked him until his head exploded. We did in the end get them done, but it wasn’t nice, it wasn’t fun, it probably didn’t do any good towards solving the problem of weave poles being fine at home and impossible at trials (in an outside the ring chat, the judge said she one had a dog like that, called him “a closet weaver”), and it took so long that our clean course wasn’t qualifying because we went over standard course time with all the time spent fooling around in the weave poles. That said, take a look at the rest of it, at the spectacular setting, and at how it cleared right up. This entry was posted in Uncategorized and tagged dog agility, Greenland NH, Sanderson Field, USDAA agility. Bookmark the permalink.